9. 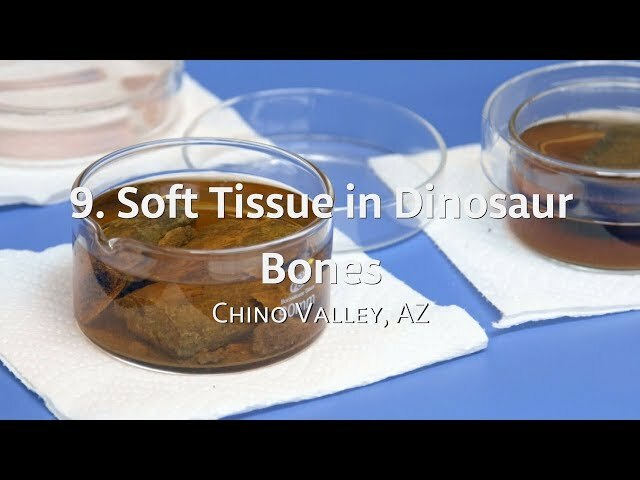 Soft Tissue in Dinosaurs - Is Genesis History? In 2005, soft tissue was discovered inside the femur of a dinosaur bone by Dr. Mary Schweitzer. Although initially controversial, more discoveries followed by other scientists. In 2012, Kevin Anderson and Mark Armitage dug out a large section of a triceratops brow horn in Hell Creek, Montana. Although the normal process of finding soft tissue is through decalcification of the bone, when Mark opened up the horn in California, he discovered uncalcified soft tissue that was stretchy and pliable. Although surprising to everyone, the presence of these intact organic materials is better explained by the bones being only thousands rather than tens of millions of years old. These discoveries can be seen as a method of dating, but they challenge the concept of ‘deep time,’ a critical component for evolution. Dr. Kevin Anderson’s videos and articles.